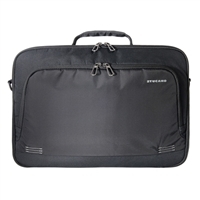 Compact and functional bag with padded compartment for transporting a Notebook (up to 15.6"). The interior compartment is equipped with a band to secure the computer during transport. The front pocket is equipped with a retainer organized into specific pockets for your Smartphone (up to 5.5"), Power Bank and business cards. The structure of the bag is reinforced around the entire perimeter and ensures maximum protection for devices within. In addition, thanks to the full opening functionality of the bag, security control checks will be faster at the airport! 16.9" x 11.8" x 3.15"